Augustine, a Latin church father, is ane o the maist important feegurs in the development o Wastren Christianity. He "established anew the ancient faith" (conditor antiquae rursum fidei), accordin tae his contemporary, Jerome. In his early years he wis hivily influenced bi Manichaeism an afterwards i the Neo-Platonism o Plotinus, but efter his conversion an baptism (387), he developed his awn approach tae philosophy an theology accommodating a variety o methods an different perspectives. He believed that the grace o Christ wis indispensable tae human freedom an framed the concepts o original sin an just war. 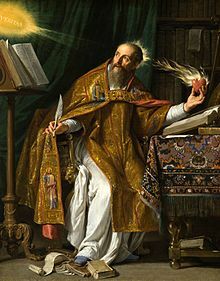 When the Roman Empire in the West wis startin tae disintegrate, Augustine developed the concept o the Church as a spiritual City of God (in a book of the same name) distinct frae the material Earthly Ceety. His thocht profoundly influenced the medieval worldview. Augustine's City of God wis closely identified wi the church, an wis the community which worshipped God. In the Catholic Church an the Anglican Communion, he is a saint an pre-eminent Doctor of the Church, an the patron o the Augustinian religious order; his memorial is celebrated 28 August. Mony Protestants, especially Calvinists, consider him tae be ane o the theological faithers o Reformation teachin on salvation an divine grace. In the Eastren Orthodox Kirk he is blessed, an his feast day is celebrated on 15 Juin. Amang the Orthodox he is cried Blessed Augustine, or St. Augustine the Blessed. ↑ Wells, J. (2000). Longman Pronunciation Dictionary (2 ed.). New York: Longman. ISBN 0582364671. ↑ The nomen Aurelius is virtually meaningless, signifying little more than Roman citizenship (see: Salway, Benet (1994). "What's in a Name? A Survey of Roman Onomastic Practice from c. 700 B.C. to A.D. 700". The Journal of Roman Studies. Society for the Promotion of Roman Studies. 84: 124–45. doi:10.2307/300873. ISSN 0075-4358. ). ↑ Jerome wrote tae Augustine in 418: You are known throughout the world; Catholics honour and esteem you as the one who has established anew the ancient faith. Cf. Epistola 195; TeSelle, Eugene (1970). Augustine the Theologian. London. p. 343. ISBN 0223-97728-4. March 2002 edition: ISBN 1-57910-918-7 . ↑ E. TeSelle gives a list of disciplines and methods that are now practiced in isolation, which Augustine utilized concurrently: natural philosophy, critical philosophy, phenomenology of finite spirit, rational theology, doctrinal theology or a theology of the history of salvation, speculative theology or Glaubenslehre, anagogical or mystical theology, ethics, ecclesiology, theology of culture, politics, logic, rethoric, cf. TeSelle, Eugene (1970). Augustine the Theologian. London. pp. 347–349. ISBN 0223-97728-4. March 2002 edition: ISBN 1-57910-918-7. ↑ Durant, Will (1992). Caesar and Christ: a History of Roman Civilization and of Christianity from Their Beginnings to A.D. 325. New York: MJF Books. ISBN 1567310141. ↑ Archimandrite [now Archbishop] Chrysostomos. "Book Review: The Place of Blessed Augustine in the Orthodox Church". Orthodox Tradition. II (3&4): 40–43. Retrieved 2007-06-28. ↑ "Blessed" here does not mean that he is less than a saint, but is a title bestowed upon him as a sign of respect. "Blessed Augustine of Hippo: His Place in the Orthodox Church: A Corrective Compilation". Orthodox Tradition. XIV (4): 33–35. Retrieved 2007-06-28. Wikimedia Commons haes media relatit tae Augustinus.